Logan is our sensitive child, but also makes himself heard. He likes to let you know when he is upset or happy with loud squawks and screams. He is saying "Dada", "Mama" when he cries, and I swear he said "hot" the other day, but I'm probably imagining it since I can't get him to say it again. He finally has two bottom teeth which he loves to feel with his tongue. He loves to pull himself up and then let go and see how long he can stand by himself. He hasn't taken his first steps yet, but I don't think they are too far away. 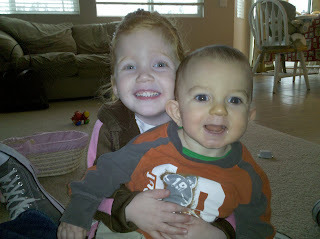 He's growing up FAST! These are a couple random pictures taken back at Christmas time that were on Jason's phone. 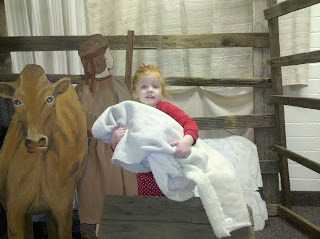 This first one cracks me up because Kamryn was trying to take off with the Baby Jesus. This one above was so cute I had to post it. Do they even look like siblings? ?